Myeloma UK has recently piloted successful Research Capacity Building workshops, to help patients, carers and family members to better understand myeloma research. Feedback from the workshops held in London and Glasgow will help researchers to make their research more accessible to patients. 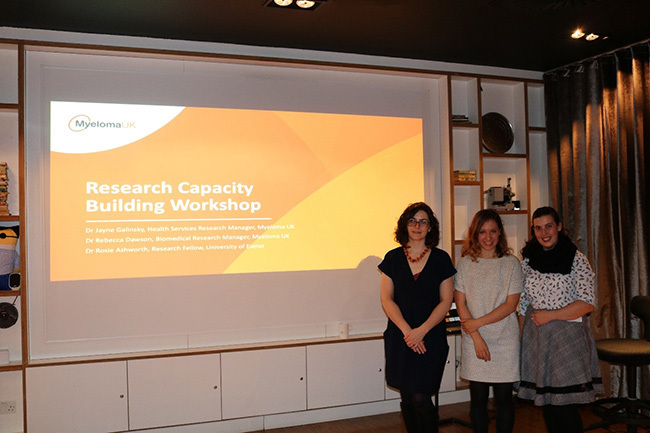 Our first MPE funded Research Capacity Building Workshops were recently piloted in Glasgow and London. The aim of the workshops was to support patients with myeloma and their family members in better understanding, engaging with, and benefiting from research into myeloma. How can patients and family members help to design good research? What is a clinical trial and what does good trial design look like? How can patients and family members help design surveys and questionnaires? What opportunities are there to be involved in research? Each workshop began by looking at examples of patient and family member involvement in health services and biomedical research. Patient involvement is vitally important to our research programmes, and is reflected by Myeloma UK’s active Patient and Carer Research Panel. Panel activities range from steering research projects, testing surveys, and commenting on materials, cuhas information sheets and consent forms for our Clinical Trial Network studies. Many of our panel members joined our workshops and feedback from these pilots was positive. We used the workshops to explore clinical trial design. Trials are an essential part of the pathway to drugs becoming available, and rely on the involvement of eligible patients to test the safety and efficacy of new treatments. However, a group exercise in which workshop delegates critiqued patient information for a real trial resulted in mixed feedback about the resource. Some patients found trial information inaccessible and found it challenging when asked to identify basic information about the trial. Workshop delegates worked as a group to generate recommendations for clearer patient information on trials, which was shared across the Glasgow and London groups. Patient feedback will be presented to Myeloma UK’s research partners to further improve patient information on future myeloma studies. Workshop discussions concluded by looking at co-production as a concept to underpin effective patient involvement in research. Co-production is based on the active involvement of patients at every stage of the research process, from what topics researchers should prioritise through to how research findings are used and disseminated. Co-production was introduced and discussed by Dr Ashworth, of the University of Exeter. Dr Rebecca Dawson, of Myeloma UK presented on clinical trials, and Sergio Diaz of Myeloma UK talked about the development and set up of a Myeloma Registry. Dr Jayne Galinsky, of Myeloma UK facilitated the workshops and discussed the importance of patient and family involvement in research across the research spectrum. Myeloma UK provides support to researchers in the application of successful patient involvement. Dr Jayne Gallinsky said, “These collaborative pilot workshops highlighted that patients with myeloma and their family members are eager to know more about research processes and have many questions about research outcomes. In particular, it is clear that patients want to be actively involved to ensure research leads to tangible improvements in health services and access to treatments.